After warm and sunshine records were smashed for May in the UK, Western Europe, Scandinavia and the U.S., NOAA's monthly global weather report has been released for May. Below are the highlights from NOAA's report. Sea ice coverage at the poles remains small. Climate-wise, Mother Earth had three of a kind in hand last month: It was the fourth warmest May, the fourth warmest March-May period and the fourth warmest year to date on record for the globe. The average global temperature in May 2018 was 1.44 degrees above the 20th-century average of 58.6 degrees F.
This was the fourth highest for May in the 139-year record (1880–2018). Last month also was the 42nd consecutive May and the 401st consecutive month with above-average temperatures. The average global temperature for March-May was 1.48 degrees above the average of 56.7 degrees, making it the fourth warmest such period on record. The year-to-date average global temperature was 1.39 degrees above the average of 55.5 degrees F.
This tied 2010 as the fourth warmest average temperature for the year to date. The average Arctic sea ice coverage (extent) in May was 8.1 per cent below the 1981–2010 average, the second smallest extent for May on record. The near-record low coverage stemmed from much-below-average sea ice in the Bering and Chukchi seas. The Antarctic sea ice extent was 8.6 per cent below average, the third smallest on record for May. Below-average ice coverage remained in parts of the Weddell See offsite link. The globally averaged land-surface temperature was seventh highest on record for May and the fifth highest for the March-May period and the year to date. 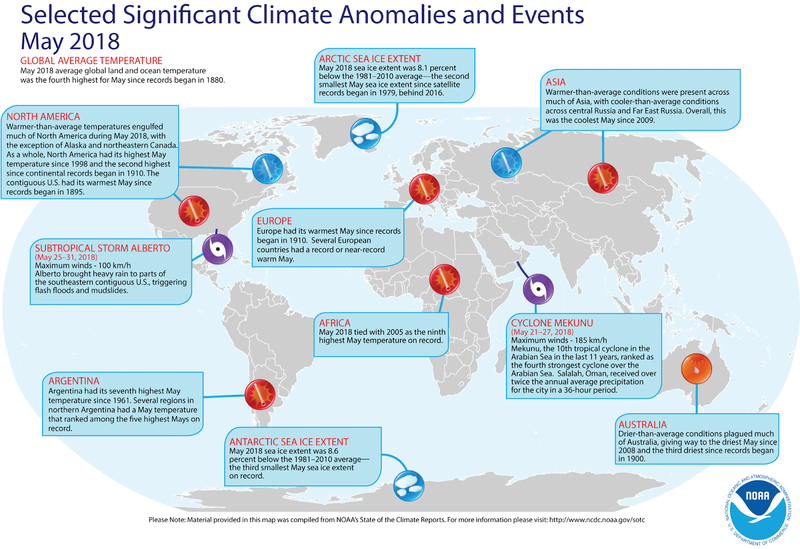 The globally averaged sea-surface temperature was fourth highest on record for May and the March-May period, and the fifth highest for the year to date. Europe had its warmest May on record; North America, its second; South America, its sixth; Africa, its ninth; Asia, its 15th; and Oceania had its 35th warmest. Access NOAA’s monthly climate report and download related maps and images.